ST. PAUL, Minn.—A counterprotest of more than 700 people defending a woman’s right to choose abortion demonstrated at the newly relocated Planned Parenthood headquarters here April 6. Several hundred opponents of abortion gathered outside the largest provider of abortion services in the state, part of an annual Good Friday protest called by Pro-Life Action Ministries. 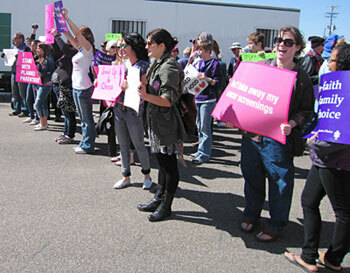 Those defending a woman’s right to choose rallied outside the new offices for eight hours. Many participants, including two young women who bought subscriptions to the paper, said to Militant supporters that this was the first time they had participated in such an action. Some came from local high schools and colleges around the state. Two days later, a small bomb exploded outside a window of a Planned Parenthood clinic in Grand Chute, Wis., damaging the building and an exam room in the clinic. According to the most recent statistics from the National Abortion Federation, there were 114 violent attacks against abortion providers in 2011, including three physical assaults, one bombing, one arson, 27 cases of vandalism and eight burglaries.